~ Substitute our Chipotle Veggie Burger for an additional $1.50 in place of our Old Fashioned Burger. Add cheese, bacon or sour cream for $.50 each. Make it a 'Soup Special' with Grilled Cheese Sandwich for $8.00. Add Grilled Chicken Breast for $2.25 or Ham for $1.00 . Served with your choice of Fries, Sweet Fries or Onion Rings. Summer-Made with Apples, Craisins & Green Onions. Citrus-Made with Mandarin Oranges & Pineapple. All plates are served with 1 side item below & a warm roll. Fresh, locally ground hamburger topped with grilled onions and brown gravy. Served with one side & a roll. Your choice of a Grilled or Fried Chicken Breast topped with our freshly sliced ham & melted Swiss Cheese. *Eggs & Hamburgers are cooked to order. Consuming raw or undercooked meats, poultry, seafood, shellfish or eggs may increase your risk of foodborne illness. 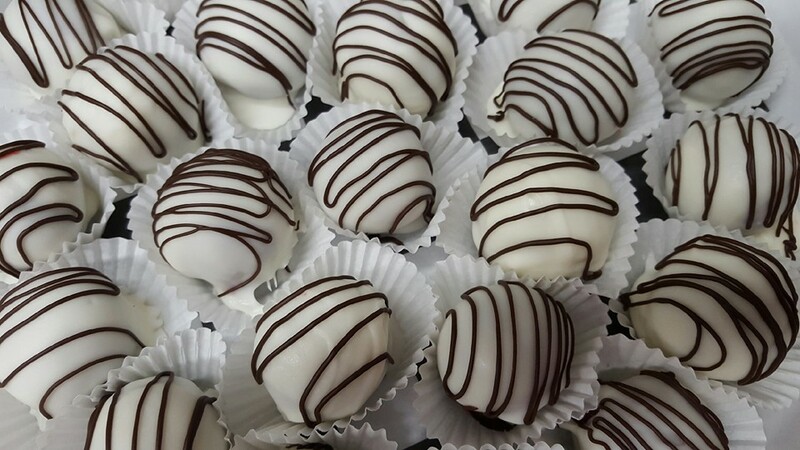 HomemadeTruffles 3/$4 or $1.50 each. Flavors may vary. Let Sweet Magnolias help cater your next gathering! Call (910) 814-3850 for pricing! © 2014 Sweet Magnolias. All Rights Reserved.